The ball transfer units allow sufficiently smooth, rigid and flat surface packages with a light, average and heavy weight to be moved in any direction. The ball transfer units, like the Omnidirectional wheels, allow sufficiently smooth, rigid and flat surface packages to be moved in any direction. The wide range produced allows the most various applications and installation possibilities with load capacities ranging from 15 to 2000 daN for each ball unit. For this reason they are not only used for conveyors but also for machines and transfers working and assembly tables in the mechanical, metallurgy industry etc, for vehicle loadingunloading systems and in airport installations. Special attention should be given to the fact that the balls should resist piercing or hollowing into the package surfaces. This is strictly related to the package weight and the system functionality is safeguarded foreseeing a security margin in the calculation of the load capacity and number of transfer ball units to be installed. The black colour Polyamide bodies have various designs to allow different types of installations and applications. The 1” steel ball rolls on a hardened cap filled with small balls. The sliding effect is always guaranteed by a felt sealing which maintains the smooth running property of this series. On request they can be supplied with the main ball in nylon. All steel body with external zinc-plated parts. This series is much stronger than the previous one and its body can be machined or deep drawn for” L” version. 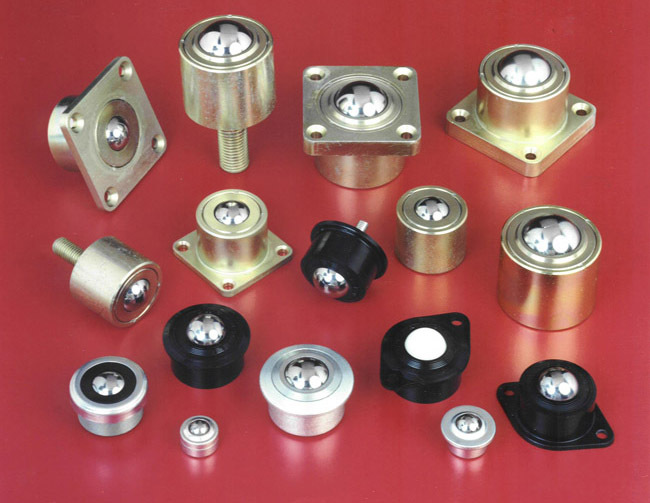 The ball units of this series are completely in stainless steel, manufactured to precision standards and designed for particularly severe and specific applications such as transfers and working tables for machine tools, heavy conveyors, metallurgic industry etc. Their construction allows them to work in either “up” or “down” applications.Spring executions for special applications are foreseen. These allow to compensate or avoid overloading and shock and the ball to shrink completely into the cap. The main balls and the small support balls are of first quality, the caps are case hardened, the support body is burnished and sealings are of felt. Severe quality control tests are carried out for this series. On request they can be supplied with different materials and designs. All dimensions indicated in this catalogue are subjected to machining tolerances and, although drawings are exact, they place the manufacturer under no obligation whatsoever. Rulli Rulmeca reserves the right to modify the products at any time without any notice.